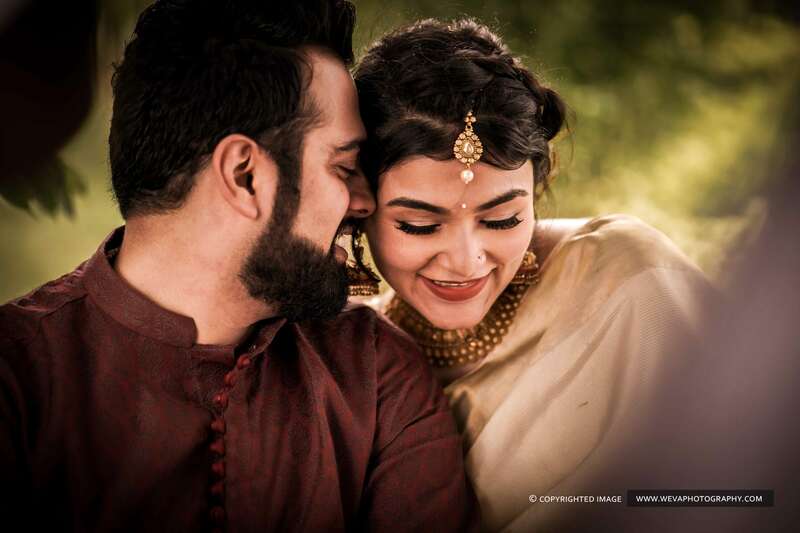 Kerala Style Punjabi Wedding Photography – Aakriti Dobhal and Aditya Krishnadas had an astonishing multicultural spectacle honouring their love and rituals. Groom, Aditya from Kerala and Bride Aakriti from Punjab. It’s so chic and dynamic. The wedding rituals started with simple Kerala Style Wedding and later adopted the vibrance of Punjab custom. The Wedding functions started with Welcome Drinks and Mehendi held at The Lawns At The Zuri Kumarakom on 27th January 2018. A wonderful extravaganza which highlights the theme of Indian culture also. Full of fun, colours and Mehendi. Decorated with flowers immersed in the richness of love and care followed by Sangeet Ceremony, Banquet Hall at Lake Song Resort 0n 27th January 2018. Great Hotel with incredible layout and ambience with most modern luxuries, a perfect place for ostentatious functions. Sparkling energy and fun everywhere.. In addition the whole Banquet Hall filled with the vibrance of the Bollywood track. Their Kerala Style Wedding took place at The Lawns At Lake Song Resort Kumarakom. Finally it’s completely a fairy tale destination wedding with the magical decor by the Team The Hue Story. Beautiful lawns, Pool Side view and the backwaters of Vembanad Kayal make the instance a perfect backdrop for a Destination Wedding. Also the functions are as per the typical Hindu Kerala Style Wedding. The Bride, Aakriti looks like a typical Kerala Bride with all the elegance and glam. It reflects an awesome bunch of Indian Traditional Threads.. Seems like the whole members fused in this festival..
Aditya and Aakriti perfectly ultimate. Her Bridal elegance highlighted by Noyrika Bhateja and Anisha Nagpal. On 28th January 2018 their Pyjama Party was also held at the Banquet Hall at Lake Song Resort. Hence there comes the end of the wonderful blow out, which is a lifetime amusement to remembered. Therefore Congratulations Aakriti and Aditya..- Kerala Style Punjabi Wedding Photography.